“True Colors” — Book for LGBTQ! SUSAN‘S BOOK TO BRING HEALING TO LGBTQ! True Colors is a very special full size, 8.5 x 11, workbook style book. It is time to heal! It is time to celebrate! True Colors is more than just a good read. It is an opportunity for readers to journal on special pages left for that purpose. Throughout True Colors Susan asks the reader frank and honest questions that require frank and honest replies. This “journaling” gives readers an opportunity to keep a running conversation with themselves. When you order True Colors order two copies. Give the second copy to a friend or a member of your family whom you trust. Ask that person to read and journal at same time you are. Or, why not take a real risk and give a copy to your hostile parent, pastor or priest. Although True Colors is written primarily for people who are LGBTQ, Susan often interjects ideas along the way that can change the mind and heart of hostile readers as well. 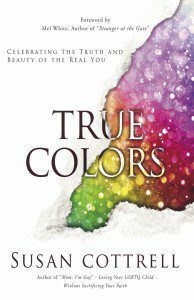 Susan Cottrell makes it very clear from the beginning that she wrote True Colors to help LGBTQ people heal relationships with parents, family, others, with God and with themselves. And she provides practical ways to go about bridging those gaps that seem too wide to cross. This is a very personal book for Susan. She is absolutely convinced that heart-healing can take place, that relationships can be reconciled. “Thank you for showing me I can trust someone and it’s okay to let my guard down. It’s okay to allow someone inside my circle.” —Ang M.